Canada tour 2018 anyone here going? 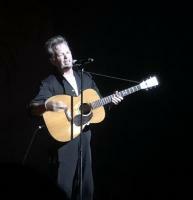 John Mellencamp Community > MELLENCAMP DISCUSSION > Tour Talk > Canada tour 2018 anyone here going? Hello Mellenheads greetings from Pennsylvania. Anyone going to a show in Canada? I noticed alot of the towns are near the US border, so not too bad of a drive from 'murica. I should be doing the ones near Toronto etc. but the dates weren't right so gonna fly out to Victoria, BC and make a vacation out of it! (Would like to add Abbotsford or Kelowna too but....) Hope you all can make it to one of the shows! Can't wait! Re: Canada tour 2018 anyone here going? Got my tickets for Kamloops show today!!! So excited, my first JM concert, even tho I've been a fan for 30-something years!!!! I'm a longtime fan, but never saw him perform live. Now I'm going to take a trip around the world. It seems you and I are travelling around the world to see him. Some of you first timers like me. How many shows are you going to? Did you know October 7 is his birthday and there is a show on that day? We just saw him last night. Another amazing concert. We had front row tickets and my parents and Lady had a blast. We met a great forum member and had one of the best experiences of the year.